This is a four-door sedan with black livery, the body is made of pressed steel panels and the chassis is spot welded and brazed together. The side of the car has the lettering: "Doring Bros 36 Hattersley St Arncliffe Auto Electrical Specialists". Inside, the trim and upholstery are in maroon coloured leatherette with white piping. The car has two bucket seats in the front and a bench seat in the rear. The head lining is white and there are rubber floor coverings. The front floor wells have added carpet car mats and a piece of offcut carpet. The dashboard has been modified and to the right of the steering wheel two instruments had been added for electric operation. These comprise a large industrial type electrical knife switch with an orange handle, which is inscribed "60 Amp Trumbull 125 volts", to connect and disconnect the power, and a voltmeter in the form of a dial. A switch for selecting forward and reverse gears has also been added. There are metallic stickers for Exide batteries on the rear right side window and the rear windscreen, a 1954 Royal Tour badge attached to the radiator grill and a NSW Registration label dated June 1981. The number 51 added near the right tail light refers to this car being the 51st converted by Roy Doring to electric power. This Model 100E Ford Prefect was assembled at the Ford plant in Geelong, Victoria. A total of 100,554 Ford Prefects were made between 1953 and 1959 assembled in England, Australia and New Zealand. The car was originally fitted with a 1172 cc Ford straight 4-cylinder petrol engine and a three-speed grearbox. 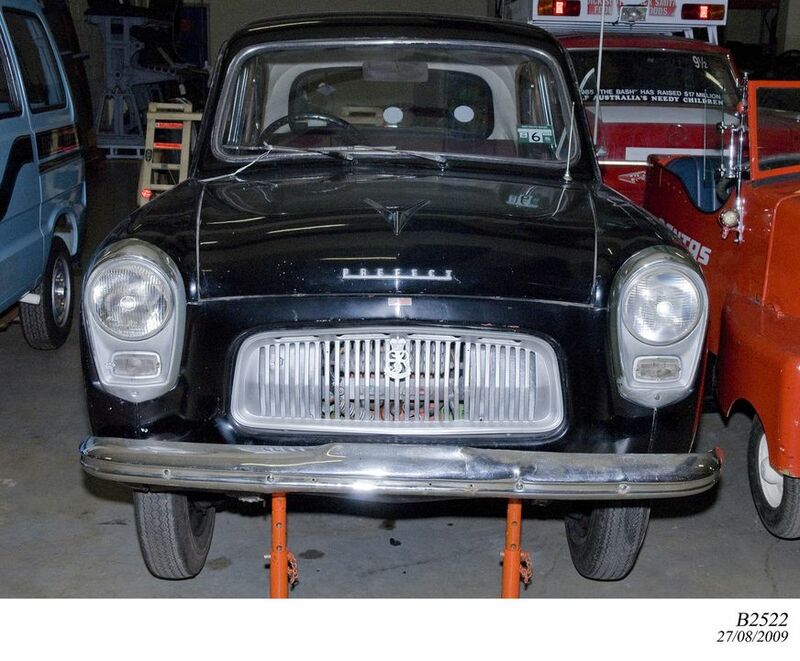 Roy Doring converted this Ford Prefect into electric operation by removing and selling the petrol engine and in its place putting an early electric car engine under the bonnet. This 3 kW electric motor was coupled directly to the original three-speed gearbox through a flexible joint. The electric motor spun at 2,500 rpm and could draw up to 220 amps during acceleration. Once the car reached a steady speed the amperage dropped to around 50. Electric power for the motor was stored in 13 batteries divided amongst the boot and under the bonnet to balance the car's weight. To drive the car was very simple. It had no clutch to push nor gears to change. The original Ford Prefect gearbox was retained to provide reverse gear. The accelerator pedal was used to drive the car forward and the normal brake to stop. When the car was parked the batteries were disconnected with a large master switch near the steering wheel. Roy Edmund Vincent Doring was born on 12 May 1903 in the New South Wales town of Barraba, and was educated at Camden Grammar School and undertook his apprenticeship as an automotive engineer in Sydney. Roy had a lifetime interest in electric cars which began in 1917 when he drove one owned by Sydney's fire department. In 1921 he established his own business as an auto electrician in Kogarah, with the assistance of his wife, Ina. Roy built his own electric car in 1941 and in 1948 purchased a pair of Detroit Electric broughams made in 1908 and 1914 by the Anderson Electric Co. of Detroit, USA. These were purchased from the Allen brothers of Allen Allen and Hemsely. He kept and restored the 1908 car for himself and it was well-known in the St Georges area of Sydney as his "grandma duck" car. The 1914 model was eventually owned by Bill Lloyd. These Detroit Electrics had been owned by the prominent Sydney solicitor, Arthur Allen, who at one time owned five of these electric cars one of which, a 1915 model, is in the Museum's collection (object number B1057).